Hay shed fires are a real problem that many shed owners face. However, with the use of the proper precautionary measures and strategies, this issue can be handled with the utmost efficiency. Hay shed fires can be caused by many factors. These may include poor preparation, spontaneous combustion and other circumstances. Obviously, we need to ensure that our sheds have that needed protection, in order to avoid any headaches later on. Monitor the temperature of your structure. Check for any signs of heating, as this can mean that there’s an underlying issue. If wilting conditions are poor or if hay moisture levels are high, do some extra monitoring and again check for possible heating. The usual signs to look out for are steam under the roof or condensation, or the smell of burnt tobacco or caramel. Take note: smoke is an indication of a pretty serious problem. It is also worthy to note that although heating is usually noticeable within days after baling wet hay, there are instances when heating appears after approximately two to ten weeks of baling. In some instances, hay sheds may even heat up months after hay is stacked, although some other reasons may be attributed to this issue. You can also opt to use hay additives to resolve heating problems. Such additives may be used to prevent the growth of moulds, which in turn, can minimise heating risks. In addition, these special additives can also help in improving feed quality and can help reduce the growth of microbes. 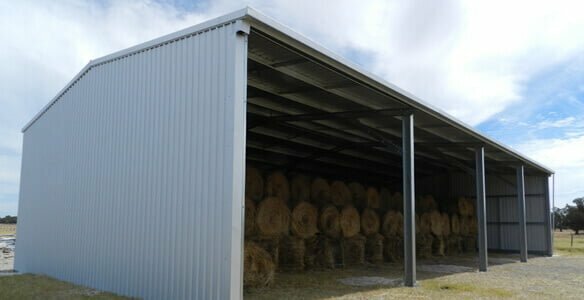 Safety does not only mean being safe from hay shed fires and heating. This also means exercising the needed safety measures while monitoring your shed or structure. If you need to walk on a hay stack to measure its temperature, use a wooden board or a ladder to prevent the stacks from collapsing or falling over. If possible, have someone to assist you, to ensure your safety. Want to know more about how you can protect your hay shed from fires? Call a Perth expert by calling 1300 778 628.